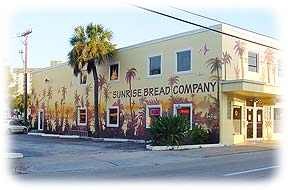 Sunrise Bread Is a great place to hang out in Titusville. We are a family owned business and make 90% of our baked goods from scratch. We offer free wifi and relaxed grownup seating upstairs or enjoy the busy meet and greet downstairs. Enjoy our speciality coffee drinks and smoothies. Our focus is whole grain products when possible. Come sample some soon. Come join the Saturday runners club or Thursday knitting group.